Glancing over the invitations to briefings and rallies from organizations with names like the Iranian-American Community of Kansas, and the Iranian-American Community of North Texas—which include broad references to the "Iranian opposition" and looming "humanitarian catastrophes"—it's fair to assume that these organizations represent a broad set of issues that face Iranians living here in the United States and back in their native country. However, attending these events reveals that all of these groups have one primary, and rather narrow, aim: removing an organization known as the as the Mujahedin el-Khalq (MEK) or People’s Mujahedin of Iran (PMOI) from the State Department’s foreign terrorist organization list, where it was placed in 1997. While advocacy groups that support the MEK assiduously cultivate an image as both the face of the Iranian émigré community in the United States and of the opposition to Supreme Leader Ali Khameini back in Iran, a range of Iran experts and members of the Iranian American community in the United States say they are neither. In fact, other Iranian Americans have felt compelled to launch a counter-campaign to oppose the MEK’s removal from the State Department’s list. Indeed, MEK supporters—including current and former U.S. government officials—often refer to the group as “the Iranian opposition,” or a symbol of “an uprising for the freedom of the Iranian people,” to quote recent statements by lawmakers, but that’s a very questionable assumption. And it prompts a set of policies that, however much they benefit the MEK, are at odds with what many experts say can best help the people of Iran. THE MEK FORMED in the 1960s as one of a number of opposition groups that supported the overthrow of the Shah. Its early ideology was heavily influenced by Marxism, as well as the anti-colonial fervor then sweeping the globe. The MEK initially supported the Iranian Revolution in 1979 but soon had a falling out with the new regime under Ayatollah Khomeini, after which most of its supporters were either massacred or fled Iran in the 1980s. Many members of the group went to Iraq, and their cooperation with Saddam Hussein during the Iran-Iraq war has since alienated much of the population in their native country. Like the dissidents in Iran and its many expatriates, MEK members oppose the current regime in Tehran led by Supreme Leader Ayatollah Ali Khameini. 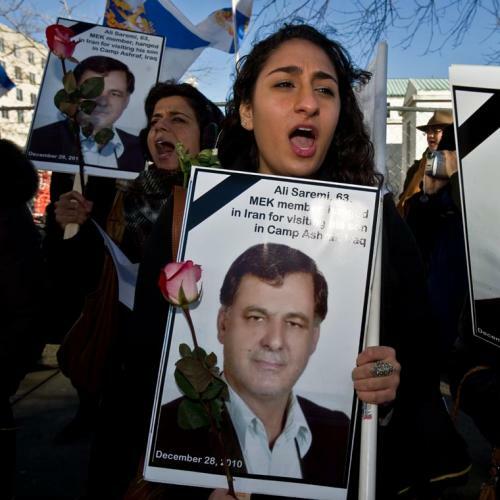 And the plight of MEK members since fleeing Iran in the 1980s certainly raises ongoing human rights concerns, particularly for the more than 3,000 members living as refugees in Iraq’s Camp Ashraf. Just this year, Amnesty International called on the Iraqi government to launch an investigation after violent clashes between Iraqi security forces and MEK members in Ashraf left more than 30 MEK exiles dead. But according to a range of U.S. experts on Iran and Iranian Americans without personal ties to MEK members overseas, neither activists in Tehran nor the average Iranian American share MEK supporters’ top priorities. As Council on Foreign Relations Senior Fellow Ray Takeyh put it flatly to a House Foreign Affairs Subcommittee in July, “Despite its activism in Western capitals, the MEK commands very little support within Iran,” due, in particular, he said, to the past alliance with Saddam. In justifying its foreign terrorist organization listing, the State Department cited terrorist attacks MEK members committed in the 1970s, which included the murder of Americans, as well as attacks within Iran in the 1990s. MEK supporters argue the listing was politically motivated and that the group’s members have since renounced violence. They also say the Khamenei regime and its allies are behind much of the negative portrayals of their movement. Despite their designation, the backers of the MEK have long enjoyed an elevated status largely by virtue of being the best organized and, for a while, the sole Iranian-American group involved in national politics. While Iranian Americans have some of the highest rates of education and voting participation of any immigrant community, their fragmentation, as well as a general skepticism about government among first-generation Iranian Americans, allowed allies of the MEK to long have the run of Washington. In the last decade, however, a second generation of Iranian Americans has begun to take a keen interest in the policy-making process, particularly on issues that affect their community and their relatives back in Iran. That was what generated the impetus for the National Iranian American Council (NIAC), an Iranian-American advocacy group that was founded nine years ago. The NIAC now boasts 4,000 dues-paying members and a mailing list of over 40,000. But Abdi and his colleagues have found that one of their challenges has been breaking through the monopoly MEK activists have enjoyed for so long, particularly on Capitol Hill. “The only interactions with the Iranian-American community” many in Congress had ever had before NIAC, Abdi recalled, “was with these MEK activists.” When it first began reaching out to congressional staffers, its members were surprised by how much confusion they encountered over their agenda and identity. Some staffers would cut them off mid-pitch, saying they had just spoken to their members in weeks prior, or they made assumptions about the sort of issues the group wanted to discuss. Longevity alone does not fully explain the reach of the MEK’s allies—then and now. The group’s activists have also conducted what even their critics readily acknowledge has been a tremendously savvy and effective lobbying and grassroots campaign, driven in part by the sheer dedication of their members and in part by significant amounts of money from undisclosed sources. One Senate staffer recounted to me how, for a period of about five months, his office “heard from people in the state all the time, and I do mean all the time,” about the human rights abuses suffered by MEK members. “It was clear they were traveling the entire state trying to meet with every state leader trying to plead their case in order to get a meeting with the senator,” the aide recounted. Other congressional staffers have told me about similarly persistent outreach to their Washington and district offices. Despite these anecdotes, it is very hard to measure the exact scope of grassroots and financial support the MEK and its de-listing campaign enjoy in the United States. The group’s supporters have had a presence on Capitol Hill for years, but it was only in 2010 that lobbying registration reports began to appear for groups advocating the removal of the MEK from the State Department’s terror list. The Iranian-American Community of Northern California, for example, paid the lobbying firm Akin Gump Strauss Hauer & Feld LLP $100,000 for that purpose through the first half of 2011. Various other groups, meanwhile—with monikers like the Iranian-American Community of Kansas, the California Society for Democracy and Human Rights, and Democracy International—have organized Capitol Hill briefings and other roundtables featuring high-profile paid speakers; rallied at the State Department and across the country; and taken out full page print ads in The Washington Post and banner ads on The New York Times website. What is quantifiable is the impact their outreach has had. 51 Democrats and 45 Republicans have signed onto a House resolution introduced this year calling on the State Department to remove the MEK from its list of foreign terrorist organizations. As has been widely reported, the group has also attracted a long list of high-ranking former officials and politicians—including former FBI Director Louis Freeh, former Attorney General Michael Mukasey, former Homeland Security Secretary Tom Ridge, and former Democratic National Committee Chairman and Vermont Governor Howard Dean—to their cause. Many, like Dean, retired Gen. Wesley Clark, and former Pennsylvania Gov. Ed Rendell, have acknowledged being paid substantial speaker fees to appear at MEK events, but they maintain that their support for the de-listing campaign is independent of financial considerations. Thus a large cadre of American public figures regularly takes to the floor of Congress, the airwaves, and the op-ed pages to draw attention to the human rights concerns at Camp Ashraf and the reasons for removing the MEK from the foreign terrorist organization’s list, as Freeh did just this week in The New York Times. UPSTART GROUPS LIKE NIAC have sought to expand the number of Iranian Americans participating in national political advocacy, as well as the range of issues they bring before policymakers. But increasingly, they have spent their time pushing back against the MEK, rather than advocating for a more robust dialogue with Iran, for example, or opposing broad-based sanctions that hurt average Iranian citizens, which top their list of priorities. In the past nine months, the group has launched its own full-on campaign to oppose lifting the MEK’s terrorist designation, including a series of briefings, grassroots outreach, and a media blitz. “We would love to sidestep it,” Abdi said of the issues raised by the MEK, “and for a long time we did.” But, he said, the group’s leaders became worried this year that the State Department would give into the pressure to remove the MEK from its terror list, which they believe would send the wrong signal to Iranian citizens and would make it easier for the Khamenei regime to taint the Green Movement as kin of the MEK. Regardless of where they stand on the MEK’s terror listing, U.S. public officials across the political spectrum profess a desire to support the Iranian people and their democratic aspirations, even as relations with the Iranian government sink to a new low. They would be better able to pursue that agenda if they distinguish between different segments of Iranian Americans, recognize the limits of the MEK’s reach, and determine how best to promote dialogue with the Iranian people, accordingly. Emily Cadei covers foreign policy for Congressional Quarterly.